We know that literacy is the key to learning in school, yet millions of middle and high school students lack the literacy skills they need to succeed. What can educators do? 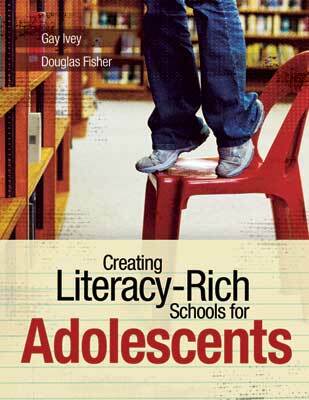 In Creating Literacy-Rich Schools for Adolescents, authors Gay Ivey and Douglas Fisher make a compelling case that all teachers—across the content areas—have a role to play in students’ development of literacy, which they define as reading, writing, speaking, listening, and viewing. Rather than focusing solely on reading instruction and the cliché that says “all teachers are teachers of reading,” they urge teachers to incorporate rich literacy-based learning experiences into their classrooms, with the goal of helping students to learn and think across the curriculum. Consider the schoolwide elements—professional development, peer coaching, leadership, and assessment—that should be in place to support teachers and students. Essential questions provide the focus for each chapter, and Quality Indicators for Secondary Literacy help readers gauge where they are on the continuum of providing a meaningful literacy experience for students. Creating Literacy-Rich Schools for Adolescents will inspire educators to take up this challenge in their own school with new confidence that the work is worthwhile and achievable. GAY IVEY is an associate professor of reading education at James Madison University in Harrisonburg, Virginia. She is a former middle school reading / language arts teacher. Ivey's research and teaching expertise include examining ways to make regular classroom instruction more responsive to individual development and motivation, particularly for older students still learning to read and write. DOUGLAS FISHER is a professor of literacy and language education in the Department of Teacher Education at San Diego State University and the Director of Professional Development for the City Heights Educational Collaborative. He is the recipient of an International Reading Association Celebrate Literacy Award as well as a Christa McAuliffe award for excellence in teacher education. Fisher has published numerous articles on reading and literacy, differentiated instruction, and curriculum design as well as books, including Improving Adolescent Literacy: Strategies at Work and Responsive Curriculum Design in Secondary Schools: Meeting the Diverse Needs of Students.